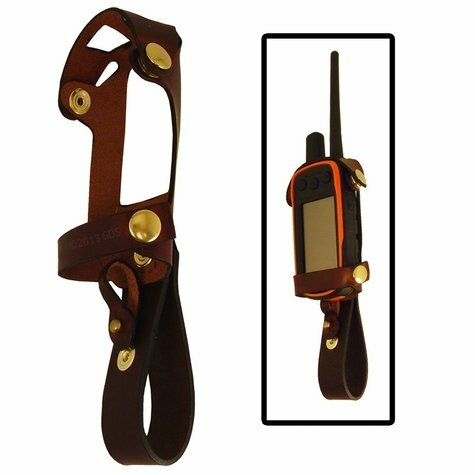 Coyote Leather Garmin Alpha Transceiver Holster . $31.50. "Very nicely made product that will last." Very nicely made product that will last. Quality product. Added a brass clip for easy clip onto vest. "The first time I used it my GPS fell out of the holster." 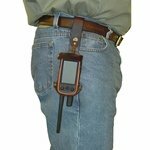 The first time I used it my GPS fell out of the holster. Lucky to find it. There is a small strap that attaches to the GPS to keep this from happening. Instruction need to be sent with each order. High quality leather. Has extra loop for security incase unit falls from holster. This is perfect for field work and training. Allows me to quickly pick up the handheld, correct or track, and let go. No fumbling around with it or having to pull it out of a holster before I can correct my dog. My only complaint is having to remove the unit from the holster to charge it. Otherwise I would give it 5 stars. I would have said excellent except in order to charge the unit you need to remove the holder which would be ok except threading the little leather tab back through. I can't see another way it could have been done though. Other than that, it's what I was hoping for. Carry your Garmin Alpha 100 GPS handheld on your belt with this leather holster from Coyote Leather. Features a secure fit with a top strap for extra security. Top grade leather with brass hardware. Point, stimulate and drop. Made in USA.